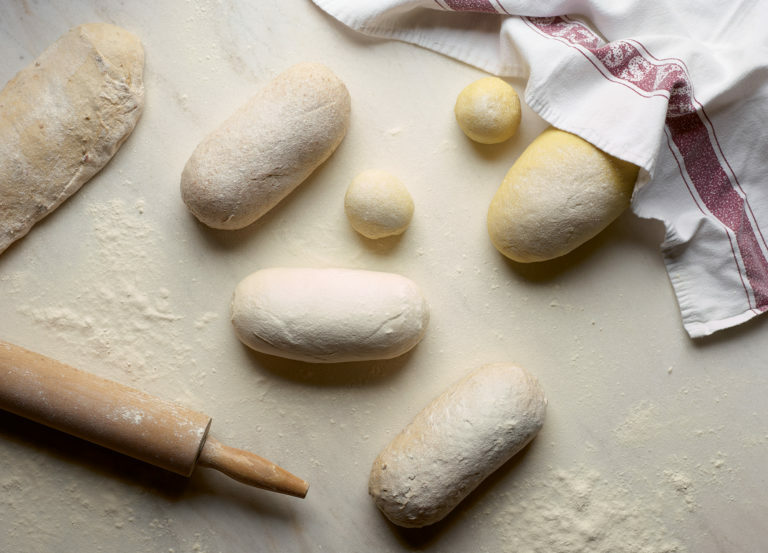 If you want the ultimate in flexibility, then our frozen dough range is for you. Simple to use and with endless opportunities to add your own unique flair you could offer your guests a different bread every day of the week (or even year) and all starting from one single piece of dough. A pre-proved 350g ciabatta dough piece made with British extra virgin rapeseed oil and chopped sundried tomatoes. Simply thaw for a minimum of 60 minutes and then bake for the perfect ciabatta loaf. When baked, produces a (approx) 300g loaf. Creates the perfect sourdough thin and crispy pizza base for you to adorn with your favourite toppings. Contains British extra virgin rapeseed oil. An 80g lightly spiced dough made with currants, sultanas, mixed peel, mixed spice & free range egg. When baked, produces a (roughly) 70g bun. Simply pipe a cross using a flour and water paste onto the bun after proving to make the perfect hot cross bun. A pre-proved 350g ciabatta dough piece made with Kentish rapeseed oil. Simply thaw for a minimum of 60 minutes and then bake for the perfect ciabatta loaf. When baked, produces a (roughly) 300g loaf. A pre-proved 350g ciabatta dough piece made with Kentish rapeseed oil and sliced black olives. Simply thaw for a minimum of 60 minutes and then bake for the perfect ciabatta loaf. When baked, produces a (roughly) 300g loaf. A 60g dough piece, made with approx. 18% butter & free range egg. When baked, produces a (roughly) 50g roll. Perfect for individual brioche rolls, mini plaits, brioche Parisienne or any shape that you require. A 470g dough piece, made with approx. 18% butter & free range egg. When baked, produces a (roughly) 400g loaf. Perfect for making into a beautiful brioche loaf, plait tin or portioning into any shape and size that you require. A 55g dough piece made with malted wheat, which when baked produces a (roughly) 45g roll. Perfect for making dinner rolls straight from the box or mould into any shape and top with seeds or dust with flour as required. A 470g dough piece made with malted wheat, which when baked produces a (roughly) 400g loaf. Perfect for making into bloomers, tin loaves, baguettes or portioning into any shape and size that you require. A 55g brown dough piece, which when baked produces a (roughly) 45g roll. Perfect for making dinner rolls straight from the box or mould into any shape and top with seeds or dust with flour as required. A 55g dough piece, which when baked produces a (roughly) 45g roll. Perfect for making dinner rolls straight from the box or mould into any shape and top with seeds or dust with flour as required. A 470g brown dough piece, which when baked produces a (roughly) 400g loaf. Perfect for making into bloomers, tin loaves, baguettes or portioning into any shape and size that you require. A 470g dough piece, which when baked produces a (roughly) 400g loaf. Perfect for making into bloomers, tin loaves, baguettes or portioning into any shape and size that you require. We love nothing more than coming up with a new idea and then watching it grow. Innovation and creativity are at the heart of our business and having the freedom to create almost whatever we want is what gets us out of bed in the morning. Get in touch to find out how we can work together and deliver products to your unique requirements.